I've had a couple people say to me "you have to teach me how to crochet!" and I always answer with, "I totally will!" ... and then never do. Part of this is just because it doesn't come naturally to me to sit down with someone and try to teach them. It's not how I learned, and so I'm not entirely sure how to teach it. I taught myself crochet by reading lots of craft blogs, watching videos online, and endlessly tearing out stitches that didn't look right. And in all this, there's something I've come to realize about crochet: If you can master the single crochet stitch - you're pretty much good to go. 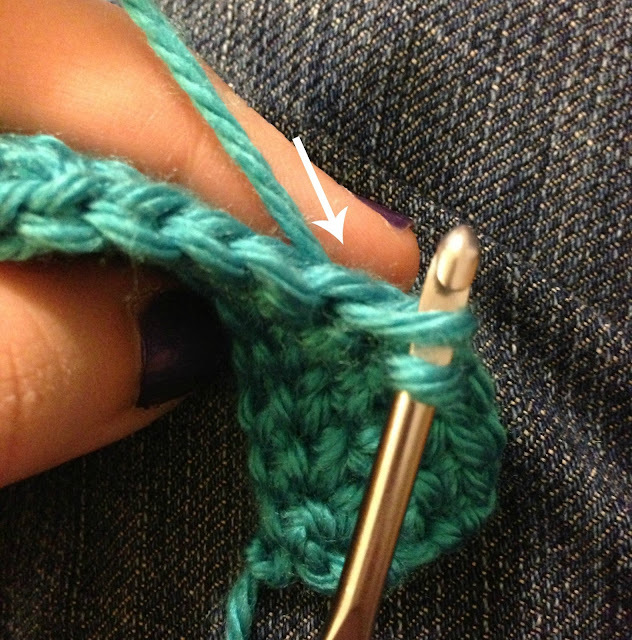 It's sort of the same idea as knowing how to do the knit stitch in knitting. It's not all there is to know, but once you've got it down, you're already well on your way to being able to make some great stuff! 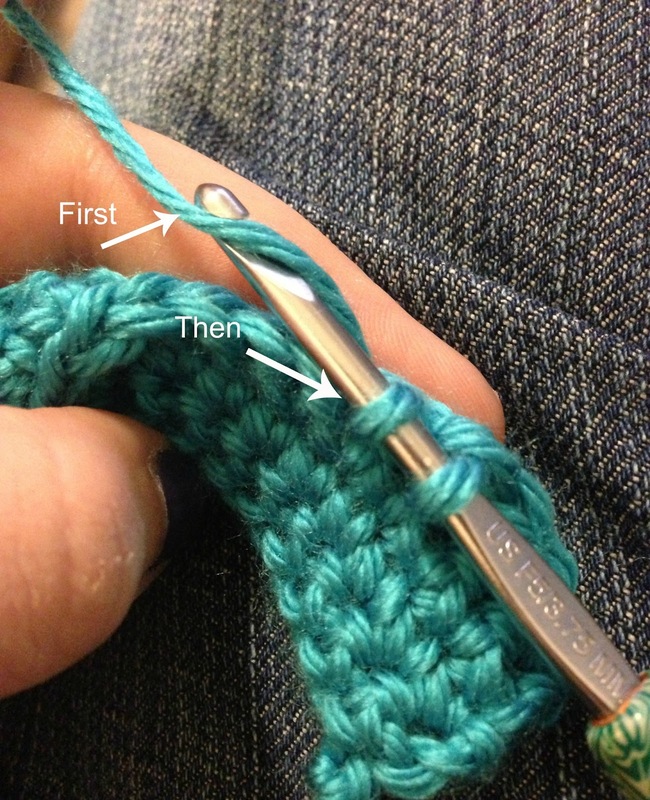 Today I'm going to do a tutorial of something I wish I had found when I very first began crocheting: a photo guide on the Single Crochet (sc) stitch. 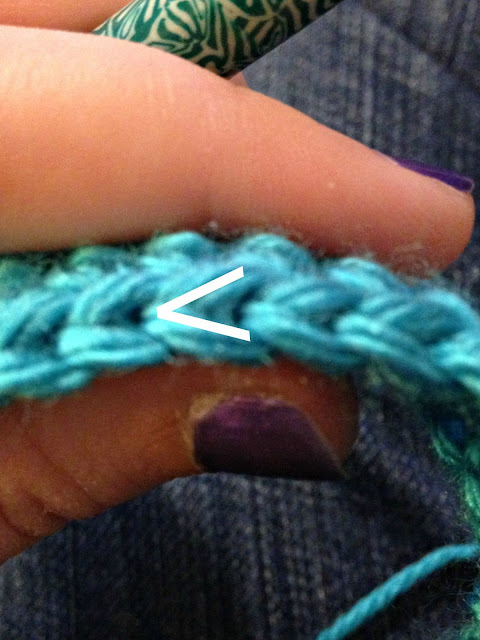 When looking at the top of a sc stitch, it creates a sort of sideways V (assuming you've already gotten your chain row down). So you just want to put your hook directly under that sideways V.
Step 3: Pull through. Grab your yarn you've just pulled over your hook, and pull it under the V. This will give you 2 loops on your hook. Steps 4 and 5: Yarn over. Same stuff as Step 2 - just place your yarn over the hook. Easy peasy. Pull through 2 loops. 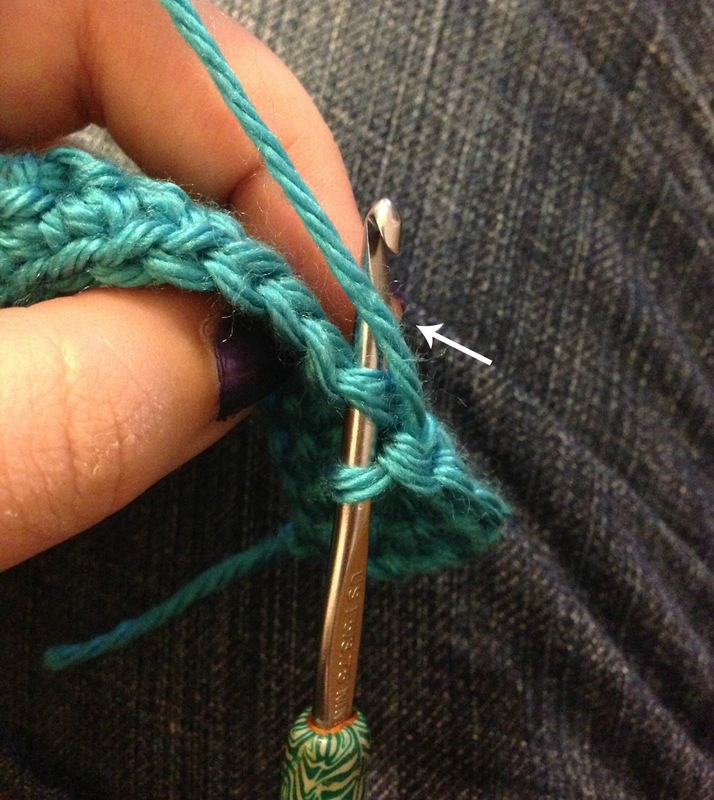 Just grab your newly 'yarned over' yarn and pull it through both loops on your hook. Step 6: Get addicted to crochet. There you go, you've completed a sc stitch. 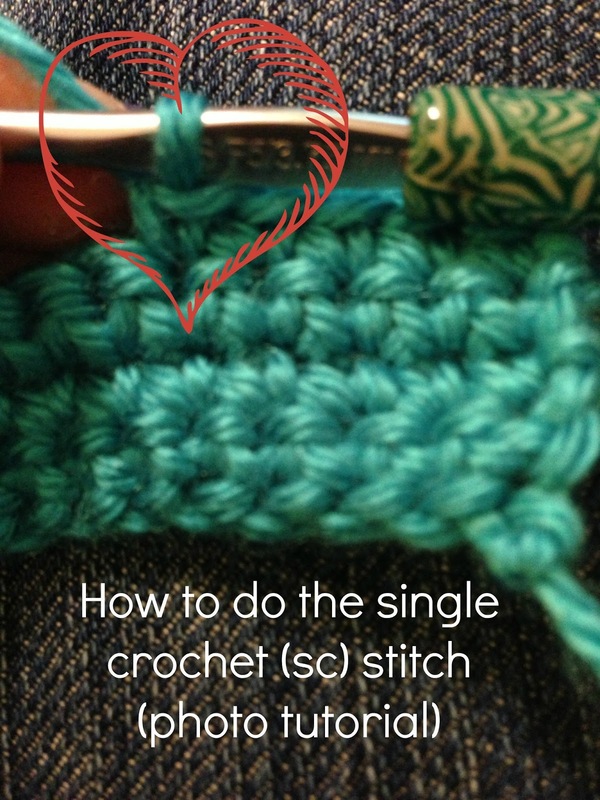 You can now make a scarf, blanket, pot-holder, hankerchief - really anything that is just stitched flat can be made with single crochet stitches. Random tips & tricks when beginning crochet: Try not to pull stuff too tight, or leave anything too loose. 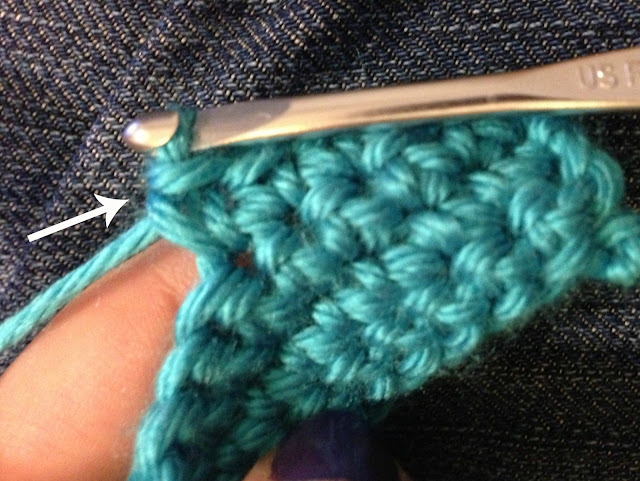 This is called the 'tension' of the stitch, and it's really something you learn by trial and error. If all your work is bunching up or you can hardly fit your hook under your stitches, you're crocheting too tightly - try letting the yarn have a little more give when working your stitches. If you really wanna go nuts and start making hats/amigurumi/dog sweaters/pretty much anything in the world - the next thing you'll want to conquer is crocheting in the round. Good luck and have fun! !